With Erev Rosh Hashanah on September 9, we will welcome 5779 with all of its wonderful themes, symbols, and traditions. As we celebrate the heralding of the New Year with family and friends, we also remember dear ones who are no longer with us. Many special holiday recipes make the memories of loved ones even sweeter—literally! In that regard, I thought it fitting to "reprint" (with permission from the author, CBI member Andrea Abel) the article below with a very special "killer" Honey Cake recipe by Elaine Folberg, z"l, the beloved mother of our own Senior Rabbi Steven Folberg. Here's wishing you and yours the sweetest of New Years! I’m a Jewish woman on a mission, stopping nothing short of returning honey cake – a traditional sweet quick bread served during the Jewish High Holidays of Rosh Hashanah and Yom Kippur – to its rightful place of honor. Honey cake has gotten a bum rap. It’s become the Jewish equivalent of the Christmas fruitcake, the “treat” at every holiday spread that everyone avoids. And for the most part I agree. The majority of honey cakes turn out dry, tough and cloyingly sweet. This might not always have been the case. I am convinced that somewhere along the way, we simply have lost the craft of baking good honey cakes. It’s no wonder. 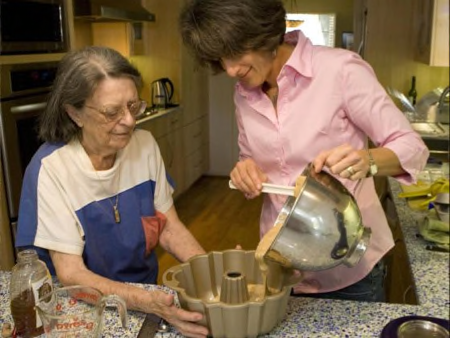 Many of our mothers and grandmothers never wrote down their recipes and certainly didn’t use measuring cups. They just baked from experience and used their senses, and they baked often. The key to recapturing the honey-cake tradition is to find a good basic recipe and learn some baking techniques. It’s actually a simple cake to make. But the same ingredients can achieve a sweet symphony of flavors or a dreadful dirge of sugary toughness. • Grease and flour the pan, getting into every corner. • Use a good quality honey and fresh spices. • Very strong coffee or brewed espresso balances the cake’s sweetness without a hint of coffee flavor in the finished cake. • Be sure to sift the dry ingredients. If you do not have a sifter, use a mesh kitchen sieve. Do not skip this step. • Fold the nuts and raisins into the dry ingredients to keep them suspended while baking, and be sure to finely chop the walnuts. • Beat the eggs on high until they are very frothy. Do the same when adding the sugar, honey and oil. This aerates the batter for a lighter cake and thoroughly incorporates the honey. • Do not overbeat once the flour mixture is added or the cake will be tough. Mix on low speed or by hand just enough to incorporate the ingredients. Alternate adding the wet and dry ingredients, putting in one-quarter to one-third of each at a time. • Do not overbake. Keep an eye on the cake, because different ovens cook different ways. • Do not underbake, or the center of the cake might fall in. • The cake is best when it’s served the day after it’s made. While I found some delightful recipes through the years – including my own grandmother’s – and these techniques definitely help, I still was hungry for more. Enter Elaine Folberg. Her son Rabbi Steve Folberg and his wife, Saundra Goldman, told me Elaine had a “killer” honey cake recipe. At 86, Elaine is a pistol but doesn’t bake anymore. Family legend holds that she was a terrific baker with a recipe for prune roll so dear that she and her husband, Joe, carried the pastry from Philadelphia to Israel for Steve when he was studying there. I had to try her recipe. On my first attempt, I knew this recipe was a winner. I tinkered a bit with it, adding more preparation instructions, a bit more spice and more nuts, but the recipe is all Elaine and filled with love. “It gives me such joy to pass this recipe down,” she told me as she watched me bake. For those who must have chocolate, try the cinnamon and chocolate-infused Chocolate Lovers’ Honey Cake (recipe below). Eureka! A fabulous, simple honey cake that deserves a place of honor at the High Holiday table. Thank you, Elaine! Preheat oven to 325 degrees. Grease and flour a 10- to 15-cup Bundt pan or two loaf pans. Into a large mixing bowl, sift together dry ingredients. Stir in chopped nuts and raisins, if using, and set aside. Beat eggs on high speed until frothy and light-colored. Add sugar and honey and beat until whipped and creamy-looking, about 1 minute. It should look like a rich cake batter. Add oil, lemon juice and rind and mix thoroughly. Alternate adding dry ingredients and coffee, beating on low speed only enough to incorporate, and scraping down the sides of the bowl as needed. With a rubber spatula, gently mix all the way to the bottom of the bowl to make sure the ingredients are evenly distributed. Pour into the prepared Bundt or loaf pans. Bake 45 minutes to 1 hour on the middle rack. Cake is done when toothpick comes out clean, top springs back slightly to touch and cake begins to pull away from the pan. Do not overbake. Allow to cool in the pan on a wire rack. When cool enough to touch, invert onto the wire rack. When cooled completely, wrap tightly in foil or in an airtight container. To allow the flavors to develop, do not serve for 24 hours. The cake will actually be moister the next day. Makes one Bundt cake (its best form) or 2 standard loaves. Preheat the oven to 350 degrees and grease a 9-inch-by-5-inch loaf pan. Melt the unsweetened chocolate over simmering water in a double boiler or microwave for 1 minute. Set aside. Sift into a mixing bowl the flour, baking soda, baking powder and cinnamon and set aside. In a larger bowl, beat the eggs and add the oil and the honey. Then add the brown sugar and melted chocolate. Alternately add the dry ingredients and the orange juice. Stir in 3/4 cup of the chocolate chips. Pour the batter into the loaf pan. Sprinkle the remaining 1/4 cup chocolate chips over the top. Bake on the lower rack of the oven for 50-55 minutes, or until a toothpick inserted in the center comes out clean. Cool on a rack for about 15 minutes. Gently run a knife around the edges to loosen the cake, then remove it from the pan.